I have wanted to try the nono! Hair Removal Device when I first started seeing ads on T.V. I have dark coarse hair on my legs, underarms and bikini area and my skin is fair so when hair grows back it is very noticeable. My method of hair removal is usually shaving and for the last few years, using an Epilator. The nono! is small hand-held electrical device that runs on a rechargable battery. It’s small enough to fit in your purse- making it perfect for travel. You run the device over the area where you want hair removed and the Nono! removes the hair. Nono! uses Thermicon technology to remove hair. Thermicon is a form of heat that destroys the hair and manages to do so without burning your skin. According to nono! , proper use of the device will result in several benefits including hair will grow in more slowly, less hair growing back, and hair will be thinner or finer. A basic kit Includes: nono! Hair Device, two thermicom tips (one wide, one narrow), a buffer, cleaning brush, charger and a quick user guide. The hair needs to be about one to three mm (stubble length) and the skin clean and dry. The device is glided over the skin and the light is supposed to stay blue, without flickering. A red light will indicate if it's not moving the correct way. When trying it out for the first time, I used my arm for practice to get used to gliding it on the skin and curved areas, while keeping the blue light staying lit. The red light means something is wrong with the device like the thermicom tips were not installed properly. However, I did find it more difficult in areas like my underarms as the light kept flickering. It was hard to navigate over the curves. After using the device a couple times, I started to get the right gliding movement down and the blue light was staying lit. I really like the light display feature - I knew when it was going right and when it wasn't. It was never painful and I didn't feel the heat at first. After passing the device on the same area for the the eighth time is when I did start to feel some heat. I did have a little redness sometimes, but it never was sore or hurt, maybe a little sensitive. There is a smell of burning hair and the company says it is a good sign because it is showing that it's doing its job. I didn’t find the scent overpowering and it was easy to get used to. After using the nono! the buffer pad included in the kit can be used to buff the skin, making treated hair (stubble) smoother and not prickly. You definitely need patience to use this device. You glide the nono! on small sections for 6 – 8 passes which can take a while if you are using it on a larger area like your legs. The user guide says results may be seen after using device four to six weeks at two to three times per week. The company also explains that it will work on thick hair, but it might take more than four to six weeks to notice changes. As with waxing or epilating, it doesn’t completely get rid of the hair but it will grow back looking thinner and finer. 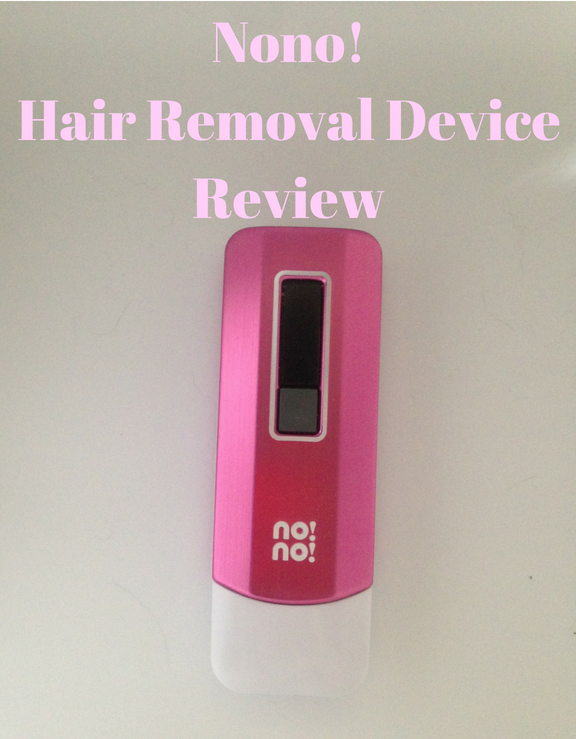 I have been using this device for a month, two to three times a week and I didn’t use any other types of hair removal while trying this so I could clearly see any differences while I was testing this device. I will say the hair that did grow back wasn’t as thick and didn’t seem to grow in as fast. But I really did not get used to the device, for me it was not quick to use. I used it on an area like my underarm for 20 minutes in different sections and it is barely noticeable. I held it in different positions and moved it at different speeds, passed it on the same section for 8 – 10 passes but it took so long for me to notice any hair being removed. For me using a Nono! Hair removal device is a lot more time consuming than some other hair removal methods. I’m not sure why I had such trouble with it but everyone is different and what doesn’t work for me might work for you. To find out more about nono! or to purchase one for yourself, click HERE!